Project Title: To design an instrument or device capable of reducing emissions of Sox and NOx from motor vehicles. Harshit Goyal, Ridhima Bhandari, Rohit Bharti, Akshay, Aastha Jain, Mudit Aggarwal, Manoj Kumar, Nidhi Sakarwal, Cheshta Soni and Anmol Agnihotri. One of the four projects awarded to Keshav Mahavidyalaya is taking on harmful gases like SO2 (sulphur dioxide) and NOx (nitrogen oxides) which are emitted from the exhaust of motor vehicles in abundance. These gases are the reason for acid rains, loss of soil fertility, chronic diseases like bronchitis and asthma, skin infections and many other major problems the world is facing today. Surveys have shown that shows that about 35% of children in India are suffering from asthma, out of which 40% are from Delhi. This alone shows that there is an urgent need to stop/reduce emissions of these gases. Project Code KM-304 is working on to reduce emissions of these gases. They have come up with a rather innovative way of doing so. They passed the gases emitted by the silencer of a diesel car, via tube in a bottle containing slurry of a calcium hydroxide(Ca(OH)2), by the process known as bubbling. This process was carried out for 30 minutes. Finally the slurry was tested. It was realised that if SO2 is present in exhaust gas then it will react with slurry to form calcium sulphite. On testing for sulphite ion the result was positive, hence concluding reduction of SO2 from the exhaust of that diesel car. That also resulted in reduced production of smoke out of that car, which was proved by a pollution checking center of vehicles at a fuel pump. Although they have tasted success, the project is still in its initial steps. Work is going on to increase the efficiency of the product and also working on reduction of NOx. If all goes well, the product might be commercialised. 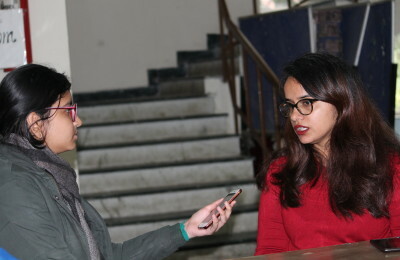 The students showed their gratefulness to the authorities of the University of Delhi for giving them this opportunity to work for the good of mankind.